Trump is a decent salesman, granted, but he's still selling snake oil when it comes to bringing jobs back that have disappeared for good. The chart above shows the real truth of the matter. These days, there are 20 thousand coal jobs in West Virginia and just under 120 thousand healthcare jobs, required to take care of an aging population. Why does an industry that is no longer a major employer even in West Virginia retain such a hold on the region’s imagination, and lead its residents to vote overwhelmingly against their own interests? Coal powered the Industrial Revolution, and once upon a time it did indeed employ a lot of people. But the number of miners began a steep decline after World War II, and especially after 1980, even though coal production continued to rise. This was mainly because modern extraction techniques — like blowing the tops off mountains — require far less labor than old-fashioned pick-and-shovel mining. The decline accelerated about a decade ago as the rise of fracking led to competition from cheap natural gas. 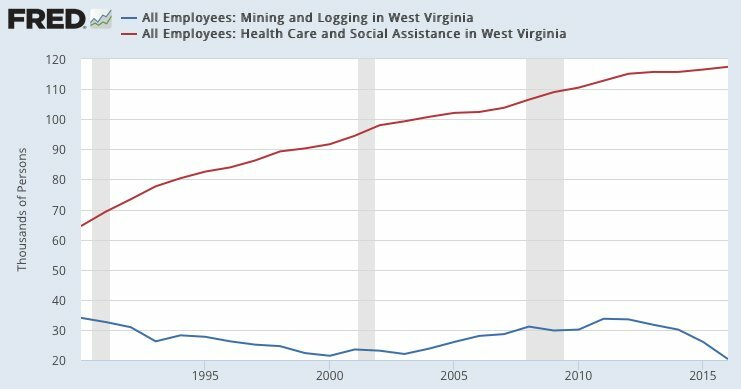 Due to the aging of West Virginians -- and a heritage of bad health brought on, yes, by the coal industry itself -- healthcare and social services account for five times the jobs that West Virginians do compared to coal, regardless of the continuing, but waning, cultural image of a time when "men were men, and miners dug deep." If coal comes back as an industry -- and that's a real long shot, given the rise of cheaper, cleaner alternatives -- maybe a few dozen jobs will result. Try telling that to the ever-present West Virginian Trump voter, and you'll get an earful. What you, and that West Virginian, won't get is very many new jobs in coal country. It's time to dig deep all right, and hope to find new industries -- God forbid they'd be in renewable energy alternatives! -- and build a new future in an aging state. Because, as Krugman says, coal is a state of mind, not a viable trade for tomorrow. Where are those new WV jobs coming from? The Medicaid expansion, with all those new citizens with health coverage from Obamacare's Medicaid expansion. So, can Trump cure West Virginia's problems by pushing coal and slamming Obamacare? No. That's a recipe for disaster in coal country. Who will it hurt? Uh, Trump voters, to be sure.